You’re the founder of a fledgling startup locked in a room with angel investor Ron Conway for exactly 30 seconds, what do you say? If you’re like most entrepreneurs, you fumble for the words to succinctly describe your startup in a sentence or two. That seems simple enough, what could go wrong in under a minute? Given the high probability of a brief encounter with a major investor in Silicon Valley, Ressi’s Mad Lib tool is helpful for any young entrepreneur. 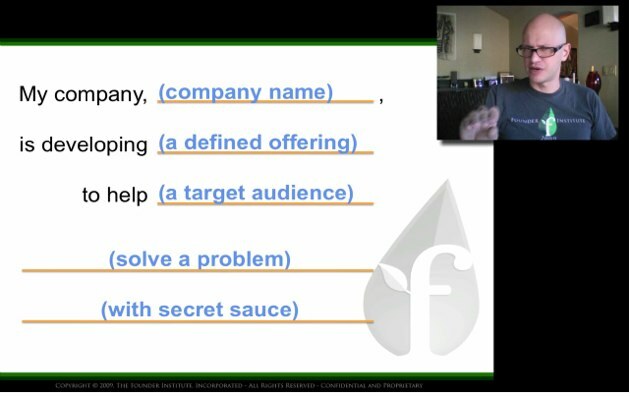 However, beyond the obvious real world application value, it’s also a fun exercise to help you focus your formal pitch and understand how you want to articulate your business. If you would like to learn more about the Founder Institute or would like to join their program, the deadline to apply for the Bay Area and Houston locations is November 7. The Founder Institute is also hosting free pitch workshops, “Ideation Bootcamps” in Seattle on November 10 and in Palo Alto, this Friday, November 5. You can sign up here. Bonus Advice: Try out your one-line pitch in comments, and Adeo will help you refine it.